The eastern part of the Brooks Range, which rises to almost 10,000 feet. 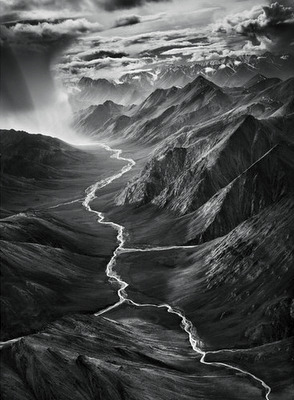 Photograph © Sebastião Salgado, Amazonas-Contact Press Images. It is funny how things work out. Just yesterday I checked in here at The Guardian to see if there had been any recent installments of Salgado's "Genesis Project." No luck. Salgado finances his projects, in part, by collaborating with a handful of prominent newspapers for advanced glimpses of images. The Guardian is one of those papers; apparently The New York Times is also since today they ran this interview and this slide show. I have been informed that, sadly, some four or five years ago, the Guardian discontinued their coverage of Genesis. The plan had been to bring it out in occasional instalments in the Saturday review magazine. This did happen over the first few years of Salgado working on Genesis. However, there was a change of editor some years ago and she felt that sales would increase with more images of fashion, etc (!) rather than photo essays on nature and so the deal was ended. So much for the Guardian's commitment to environmental awareness.